India has become an attractive investment destination for investors all around the globe. The growing popularity of the Indian leadership, improved foreign relations, strong institutional flows, stable and reformist government, multi-year low inflation and interest rates, improving the economy and promising future are a few of the key leading factors. These create highly favorable opportunities for NRI investors to explore different investment avenues of the Indian markets and invest in India. As per Foreign Exchange Management Act, an Indian citizen is termed as a Non Resident Indian (NRI), if one has either stayed in India for 183 days or less in the last financial year. 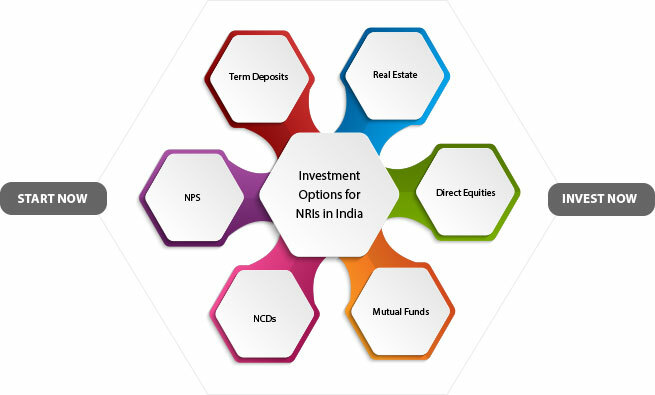 NRI investment in Equity is another option to consider. The Portfolio Investment Scheme (PIS) of RBI enables NRIs to invest in the Indian stock market. Under PIS, NRIs require to get a one-time approval to participate in the Indian stock market. However, NRIs cannot invest over 10% of the paid-up capital of a company and cannot trade shares on a non-delivery basis. In order to invest in stocks, NRIs require to transact through a stock broking firm for which one needs to open a demat account with a SEBI registered brokerage firm. In addition to a demat account to hold shares, NRIs also require a trading account with a stock broking firm and an NRE account or NRO account with a bank. Along with equity, NRIs can also invest in the Future and Options (F&O) segment of the exchange. In order to participate in the F&O segment, NRIs are required to approach a clearing member who can clear the trades for allotment. Clearing corporation allots unique custodial participant (CP) code to all NRI investors based on the application received from the clearing member. NRIs can trade Derivatives viz. F&O trading through intraday trading, short position, Index trading and leverage. Exchange-traded funds aka ETFs are marketable securities owning underlying assets like stock, bonds, oil futures, gold bars, foreign currency, etc. Though it may seem similar to mutual funds, ETFs are different and are commonly traded as stocks on stock exchanges with fluctuating prices based on its buy and sell and the value of the underlying assets. ETFs also have high liquidity and low fees, making it an attractive investment option for NRIs. NRIs require Non PINS account to invest in ETF on Repatriable and Non-Repatriable basis. When governments and other companies require funds for their projects or expansion, bonds are issued. Investing in bonds makes the investors a lender and provides a slice of ownership in the company. Investors are also entitled to receive fixed returns on their investment. NRIs can freely invest in Bonds and government securities through NRE and NRO accounts. However, repatriation benefits are applicable for NRE accounts which have completed 3 yrs, while benefits of maturity credited to the NRO account cannot be repatriated. Certificate of Deposit (CD) is money market instruments issued either in demat form or promissory notes by banks and financial institutions. These are similar to fixed deposits but have higher liquidity and can easily transferable. The certificates are generally issued at a discount rate and have effectively higher returns as compared to other bank investments. NRIs can invest in Certificate of Deposits through NRE accounts on a repatriable basis. National Pension Scheme is a retirement savings scheme of the Indian Government and a good investment alternative. Under this scheme, investors are allotted unique Permanent Retirement Account Number. It is a cost-effective and tax-efficient scheme with flexibility in investment amount and regularity. It also offers the option to choose from fixed income options, government securities or equity-related investments. NPS offers good returns on investment and a regular income along with a corpus for retirement. NRIs who hold Indian Citizenship and are between 18 to 60 years of age can invest in NPS through NRE/NRO account. Insurance has been one the most preferred mode of investments for Indians. NRIs can invest and buy insurances in India. With evolving time, several insurances are designed especially for NRIs. These insurances cover death, disability, disease and also offer lumpsum benefits. Different mode of premium payment for insurance is available for NRIs. One can opt for direct remittance through banking channels, remittances through postal channels, etc. Real estate is one the most traditional and all-time favorite modes of investments for Indians. It is also a popular choice amongst NRIs as NRI investment in property is allowed, provides emotional security to have a property in the homeland and most importantly because India is a developing nation with soaring property prices. NRIs can invest in both residential and commercial properties with no restrictions on amount or size of the property. However, NRIs are not permitted to buy agricultural lands, farmhouse or plantations.